12000 BTU 16.9 SEER 220V/60HZ. 11 ft (approximately) lines copper pipes. Heat pump: Does not have. Indoor Unit (Air Handler). 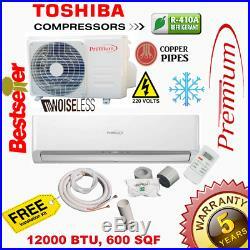 Outdoor Unit (Toshiba Compressor pre-loaded with R-410A). Digital LCD Remote Control. 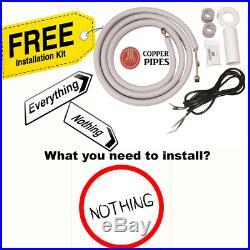 Product and Installation Manual. Line set and wire 11 ft approximately. Neoprene putty to seal holes. Wall bracket and drain pipe for Indoor Unit. We do not require signature confirmation for deliveries. To be free from defects in materials and workmanship under normal use and maintenance as described below. All Warranties applies to. To the original registered owner and his or her spouse (owner). The COMPRESSOR is warranted for a period of FIVE (5) YEARS. All remaining parts are warranted for a period of ONE (1) YEAR. The product is installed in an owner-occupied, single family residence. The product remains in the original installation location. The product is installed by contractors who are licensed HVAC professionals and in compliance with all local and state laws. The product is installed, maintained and used in accordance with the manufacturers recommendations as outlined in the Installation and Use & Care manuals. FOR ANY INCIDENTAL OR CONSEQUENTIAL PROPERTY DAMAGE, POSITIVE THINGS LLC. SHALL NOT BE HELD RELIABLE. For residents of states do not allow the exclusion or limitation of incidental or consequential damages, the above exclusion may not apply to you. Damage or failure as a result of abuse, winds, floods, fires, accidents lightning, accidents, corrosive atmosphere or other conditions beyond the control of Positive Things LLC. Use of components or accessories that are not compatible with this unit. Damage or repairs resulting from faulty installation, application, maintenance, abuse or unauthorized alteration of the product. Failures to start due to interruption and/or inadequate electrical service, blown fuses, or open circuit breakers. Parts not supplied by Positive Things LLC or damage resulting from the use of parts not supplied or designated by Precision Trading Corp Positive Things LLC. Damage caused by frozen or broken water pipes in the event of equipment failure. Changes in the appearance of the units that do or do not affect its performance. Any cost related to the replacement, refilling or disposal of the refrigerant. Increase in fuel or electric cost. For export only: Some states in USA require more SEER (it is not suitable for inspection). 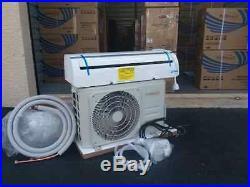 MINI SPLIT 12000 BTU ONLY COOL, FREE INSTALLATION KIT. The item “Premium Mini Split 12000 BTU 16.9 SEER System Ductless AC ONLY COLD 220V” is in sale since Wednesday, December 5, 2018. This item is in the category “Home & Garden\Home Improvement\Heating, Cooling & Air\Air Conditioners & Heaters\Central Air Conditioners”. The seller is “yudiergonzalezaleman” and is located in Naples, Florida. This item can be shipped to United States.